Study Guides for Christian Wellness Studies and Discipleship Training – by Rev. Ron Lively, M.Div., M.A. Click HERE for some Study Guides of books like In His Image, Fearfully & Wonderfully Made; Addiction & Grace; Essential of Discipleship, etc. In His Image – by Dr. Paul Brand & Philip Yancey. Zondervan Publishing House, Grand Rapids, MI. (1984). In Fearfully & Wonderfully Made, Philip Yancey and Dr. Paul Brand revealed how God’s voice is encoded in the very structure of our bodies. In His Image takes up where its predecessor left off, beckoning us once again inward and onward to fresh exploration and discovery. Yancey and Brand show how accurately and intricately the human body portrays the Body of Christ. In five sections―Image, Blood, Head, Spirit, and Pain―the acclaimed surgeon and the award-winning writer unlock the remarkable, living lessons contained in our physical makeup. This Gold Medallion Award-winning book will open your eyes to the complex miracle of the human body, and the even more compelling spiritual truths that it reflects. Addictions And Grace. by Gerald G. May, M.D. Harper & Row Publishers, San Fransciso, 1988. Essential Haitian Creole Expressions tapes, please click HERE or in our Dropbox at HERE. These audio recordings are very helpful for anyone who needs to learn some basic expressions in Creole. This was a project of my good friend, the late Valarie Olivier who died as a result of a car accident in Haiti. Please share these with anyone who is doing mission work in Haiti. Best Daily online Devotional (in my opinion) is My Utmost for His Highest now on a daily website at www.utmost.org. Be ready to read each one more than once to gain the full value of these rich teachings about being surrendered to God, His Spirit, His Son and His Will and ways. Enjoy. Sign up today to join a solution-focused, membership-driven movement. Are you willing to help adjust the course of the health care storm? Our goal is to chart a new course by highlighting problems and offering sustainable solutions for affordable health care. For many health care providers and businesses, THRIVING is a dream…SURVIVAL is a reality. We want you to know that there is HOPE! A comprehensive online community and resource for opportunities, education, networking, and support to begin or further a journey in healthcare missions. It’s the place to search for serving opportunities, connect with organizations, share stories, and learn about missions preparation, global health issues, and much more from an extensive library of free content. 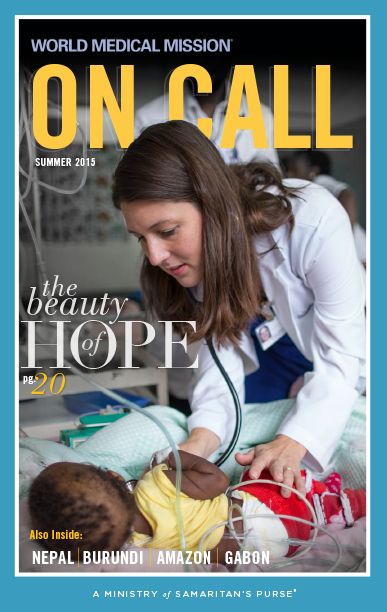 Click on the World Medical Mission’s On Call magazine image to read or download the latest edition of On Call. Each issue includes stories of how your support enables World Medical Mission to bring help to the hurting in Jesus’ Name. The “Calling for Help” page includes a list of mission hospitals that need short-term assistance. If you’re interested in healthcare missions, then this resource is just for you. Answering a call to missions presents many common challenges. A Missional Life brings together an inspiring collection of experiences, wisdom, and insights from 14 of the most engaged and influential individuals in healthcare missions today. Journey with your heart and mind through a series of conversations to better prepare for engagement in the world of medical missions – and ultimately in living a missional life. The book defines a missional life as “a life surrendered to Christ for service in line with the Great Commission, following wherever and however that may unfold; marked by a deep commitment and obedience governed by a close relationship with Christ to closely listen, continually hear and follow through.” So if you’re looking to learn how to fully surrender yourself to a missional life, this resource is just for you. This is a Christian Health Sharing Program. This is a Biblical community where Samaritan Ministries members are a group of believers that have come together in Biblical community to help bear one another’s medical burdens without the use of health insurance. This is one of the first of what is being called Association Health Plans that may be what successfully replaces Obamacare. The community of believers comes together as one Body to assist members in need. This way, individual believers are connected to the larger Body of Christ as they give and receive financial, emotional, and spiritual support. Please use our referral code which is: “Penny Lively – Healthy Initiative Ministries” if you join this growing network of thousands of members sharing $millions of real health care bills monthly. Our ministry will put the referral income to good use like paying for our monthly shares, etc. Click HERE for The Four Year Career – a valuable resource to help better understand the Stream Opportunity.